Beyonce in Jay Z are still Crazy in Love! And how best to celebrate sti.. Pop royalty Beyoncé and Jay Z continued to the South of France from.. Hot mama! 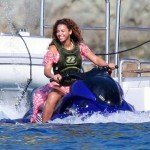 Beyonce turned 32 on Wednesday and decided to party in style o..
That is one fierce yacht for Sasha to be on! Reigning queen of pop Beyon..